Derailleur hangers are easily bent and can cause shifting problems. Today we’ll learn how to straighten integrated derailleur hangers. Shifting problems caused by a bent derailleur hanger are quite common. 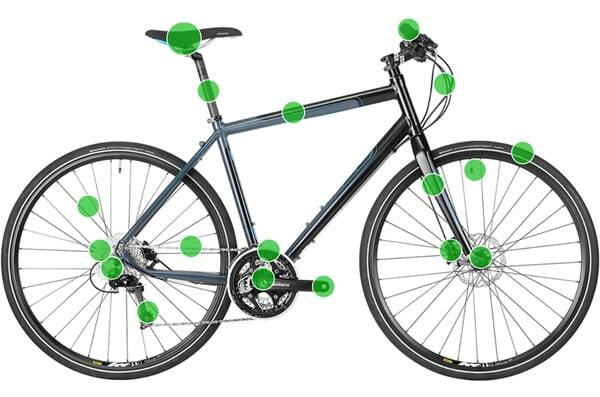 This can happen if your bike is dropped, crashed or bumped, or if it was poorly aligned at the manufacturer. The result is poor shifting even after all other adjustments have been made. For this job you’ll need a repair stand and a hanger alignment gauge like this one called the DAG-2.2 from Park Tool. When compared to bike shop labor charges, it will pay for itself after 3-4 uses. You’ll also need a 5mm hex key for the derailleur mounting bolt, and a string or small strap to hold the derailleur out of the way while you align the hanger. It is important to make sure your rear wheel is true and properly mounted in the frame dropouts, as the alignment tool compares the derailleur hanger to the rim surface. See the tutorials titled How to Remove and Install Your Wheels and How to True a Wheel. The first step is to shift the rear derailleur onto the smallest sprocket and then remove the rear derailleur by turning the mounting bolt all the way counter-clockwise. There is no need to remove the shift cable or chain. Then tie the derailleur up onto the frame to keep it out of the way. If you have a replaceable derailleur hanger, you’ll first want to make sure the bolts holding it in place are properly tightened so they don’t move. Now thread the tool’s shaft all the way into the hanger threads by turning it carefully clockwise into where the derailleur was mounted. If it doesn’t thread in smoothly, the threads may be damaged and need to be chased with a tap. We’ll cover this in a future tutorial. Do not use the tool’s threads as a thread chaser. We’ll be checking the alignment at four different places on the rim: the 9 o’clock and 3 o’clock for horizontal alignment, and the 12 o’clock and 6 o’clock for vertical alignment. When aligned correctly, the alignment tool’s indicator will be roughly the same distance from the rim at all four locations. For horizontal alignment, move the alignment tool’s arm to the 9 o’clock position and rotate the wheel so the valve is at the same spot. Loosen the knob and slide the indicator so it contacts the outside edge of the rim, and then tighten the knob again to hold the indicator in place. Now rotate the tool arm and valve around to the 3 o’clock position and see where the indicator sits. If the tip of the indicator is within 4mm of the rim on this side then the horizontal alignment is ok. If the difference is more or less than 4mm, carefully pull or push the tool’s arm, using it as a lever to slightly bend the hanger in the right direction, and then re-check the alignment on both sides. You may need to repeat this process a few times until the alignment is within range. It’s important not to bend the hanger too much with the alignment tool. It’s best to bend it a little bit and then have to bend it some more, rather than bending it too much and having to bend it back again. For vertical alignment, keep the indicator in the same position and then check the 12 o’clock and 6 o’clock positions the same way we did for the horizontal alignment. Always remember to move the air valve along with the indicator and place the indicator at the outside edge of the rim. Once the hanger is aligned and within 4mm both horizontally and vertically, unthread the alignment tool. Apply a little waterproof grease to the derailleur’s mounting bolts threads and begin threading it back in clockwise. Make sure the B-screw adjustment is sitting behind the derailleur hanger. Then tighten the derailleur to the specified torque, usually around 8-10 Newton Meters or 70-90 Inch Pounds.